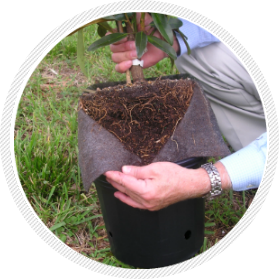 Smart Pot Pruner™ is a fabric sleeve that lines your plastic container to stop root circling, promote root pruning and gives you the fastest re-establishment time once the plant is moved from the pot. Want smoother transplants and stronger roots? Our system is totally radicle. 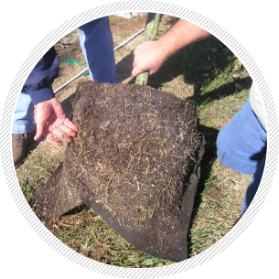 When the roots of a plant touch the fabric sleeve, they entangle and do not circle. The root tip loses its apical dominance and the root begins to side branch. A healthy, fibrous root structure soon develops (instead of the harmful root circling of a pot-in-pot operation shown to the right). A better root system gives you better, quicker growth! creating a healthy root ball. 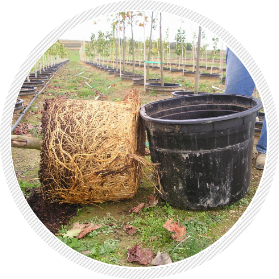 When you ﬁnally do move the plant to a larger container or into the ﬁeld, that root ball explodes with new growth. The process of removing the fabric slightly scores the root tips, sending a chemical message for the plant to begin reproducing roots. The plant will root into the new area with amazing quickness. 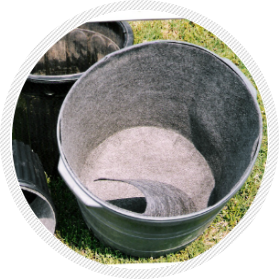 Pot Pruner™ offers another big advantage - insulation. Your plants stay warmer in the winter and cooler in the summer. 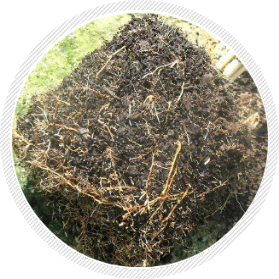 There is no summer “hot side of the pot” - roots grow evenly throughout the entire container. Insulated temperatures give better, more consistent, year round growth. 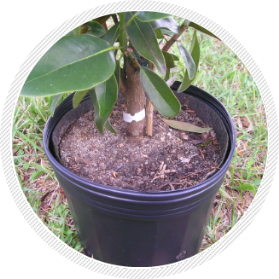 Pot Pruner™ is a better product for container root pruning than copper. It is not toxic to the plant, to the ground or to your employees. The fabric sleeve cannot be “used up” like copper paint, so it continues to root prune long after copper paint has given out. And the Pot Pruner™ can be reused. With copper, the container needs to be washed and repainted, a cumbersome, toxic process. Pot Pruner™ is the ideal product to stop, or greatly slow, root traveling in a Pot-In-Pot system. 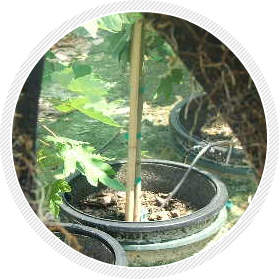 Root traveling from the liner pot to the socket pot and into the ground is a major problem in every Pot-In Pot system. Ready To Upgrade Your Pots? Every growing season begins with determining what you are growing and to what size. That determines how your plants will be spaced out, managed and what system to use. 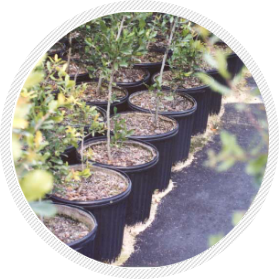 patterns for the most common plastic pots used in the nursery industry. If we do not have the pot you use, we may need you to mail us a sample, and we will make a pattern for it. the Pot Pruner do its job of insulating against extreme heat and cold while pruning the roots for a healthy root structure. Remove the fabric before re-planting. The Pot Pruner™ is used most effectively on plants that will be stepped up to larger containers or field planted. That is because the process of removing the fabric actually tears the tips of the roots. 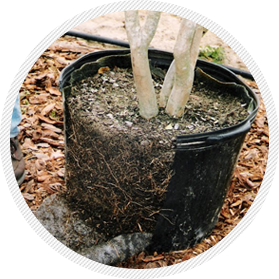 This causes the plant to begin growing new roots and helps it re-establish quickly. 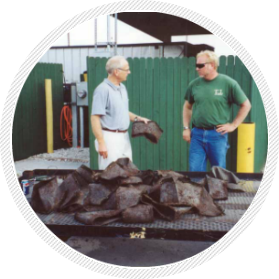 The Pot Pruner™ is made of a tough fabric that can be reused over and over. To reuse the Pot Pruner™ we recommend letting it dry. This will assure any pathogens or plant disease cannot survive on the fabric. Store used Pot Pruners™ in a dry area. If you have any questions, give us a call or send us an email. Because most issues or problems that may come up, High Caliper has most likely dealt with them with past customers and can help you work through it.